"Challenging the Chip is essential reading for anyone who owns a cell phone or computer. As its vividly written chapters reveal, our digital possessions connect us not only to global information but also to global contamination and injustice. Happily, this book shows us that we can have technology and clean water, too: Electronics sustainability is organic agriculture for iPods." 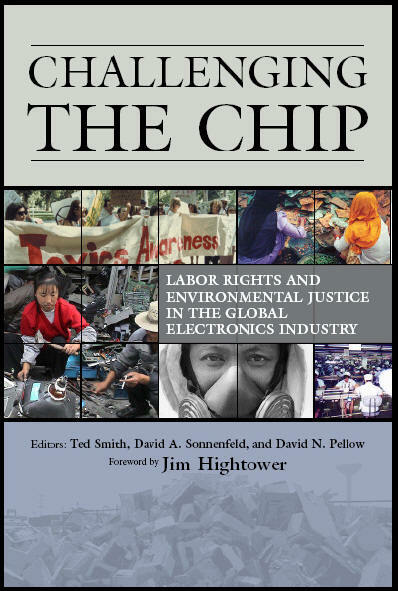 This book is the first comprehensive examination of the impacts of electronics manufacturing on workers and local environments around the world. The contributors to this volume include many of the world’s most articulate, passionate and progressive visionaries, scholars and advocates involved in documenting and challenging the social and environmental impacts of the global electronics industry. From Asia, North America, Europe, and Latin America, the authors are renowned for their contributions to the science and the politics of environmental and social justice, and bring these perspectives to the high-tech sector throughout the book. The book's twenty-five chapters not only document the unsustainable practices of the growing electronics sector over its first quarter of a century, but also propose and chronicle creative ways in which community and labor activists, government agencies, and others have attempted through resistance, regulation, and other means to introduce more sustainable systems of production into that sector. Electronics is one of the world's largest manufacturing sectors, with social, economic, and ecological impacting six continents across the planet. The production of electronics and computer components contaminates the air, land, water, and human beings with nearly unrivalled intensity. These in turn are problems also of labor rights (particularly occupational safety and health) and environmental injustice in that the people whose health is being compromised in this "new economy" are largely working class, poor, female, and often from immigrant, and ethnic minority populations. This volume documents and contributes to an important international discourse of citizens, workers, health professionals, academics, labor leaders, environmental activists, and others, developing alternative visions for the regulation and sustainable development of electronics manufacturing, assembly/ disassembly, and waste disposal around the world.